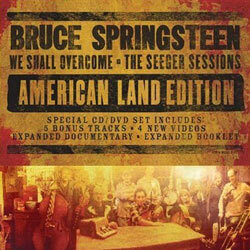 Bruce Springsteens aktuelles Album “We Shall Overcome – The Seeger Sessions” (Columbia Records) wurde von den achtundvierzig Musikredakteuren des “Billboard Magazins” zum zweitbesten Album des Jahres 2006 gewählt. Closely following Dylan was fellow rock-pop legend Bruce Springsteen, whose latest album ‘We Shall Overcome – The Seeger Sessions’ made #2 with a total of 58 points. Alle Beilagen sind in kleinen Briefumschlägen deponiert, die alle 10-20 Seiten an passender Stelle fixiert wurden. Seit kurzem ist das Buch auch in Deutschland erhältlich. Mehr Infos hier. A biography of Bruce Springsteen and the E Street Band follows the group from their early days in Asbury Park, New Jersey, to the heights of international stardom, documenting the individual members of the band, musicianship, and life on the road. “Greetings from E Street” celebrates the passionately loved group that has been entertaining the world for 35 years. Written with their cooperation, this fully illustrated informal biography combines rare photographs with 30 removable facsimiles of E Street memorabilia, including Bruce Springsteen’s first business card and hand-written set list, and even two fabulous posters. Longtime band intimate Robert Santelli captures the ecstatic highs and devastating lows on the E Street Band’s roller coaster ride to stardom. 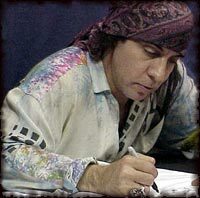 He follows the band from the early days in Asbury Park, New Jersey, to the critical acclaim of Born to Run, the mania of Born in the U.S.A. and international touring, and each member’s unique projects. 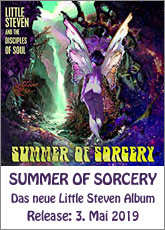 Throughout, the band’s signature combination of friendship, humor, and stellar musicianship is revealed in stories, snapshots, and the ephemera of life of the road. Warm and personal, Greetings from E Street is a postcard from the most famous address in rock and roll. Robert Santelli has written extensively about Bruce Springsteen and the E Street Band since the early 1970s. The author of nearly a dozen books, he is a frequent contributor to magazines such as Rolling Stone and Backstreets. He is currently the artistic director of the Experience Music Project in Seattle.